Offers.com, a site that aggregates online coupons, discount codes, and other deals from around the web, has closed a $7 million funding round from Susquehanna Growth Equity, LLLP. This is the company’s first round of funding — up until now, it’s been funded by founder and CEO Steve Schaffer. Unlike the many daily deal sites like Groupon that we’ve heard about recently, Offers.com is focused on more traditional sales. Visit the site, and you’ll see a list of major retailers and services that are offering discounts (you can also browse listings of offers sorted by genre). The site has been live in the US since February 2009, and it’s recently launched versions in Canada and the UK. One of the site’s core features is a ‘Locker’, which launched a year ago: you tell the site which offers, stores, and categories you’re interested in, and it will give you a feed of recently added deals. Another differentiator for Offers.com is the fact that it employs an editorial staff of over twenty, who write content for the site. The company is now up to 40 employees in total, with plans to grow to 60 over the next year. Offers.com launched last year, and is published by performance marketing firm Vertive, which was founded back in 2003. The company earns money through affiliate programs. 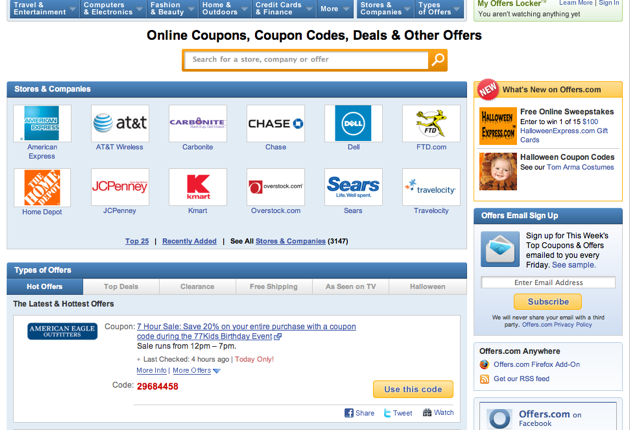 There are myriad competitors in this space including RetailMeNot, Savings.com, CoolSavings, and Coupon Cabin.